Winston-Salem, NC-Malvin Pena took a no-hit bid into the sixth inning to earn his first Carolina League win, and the Potomac Nationals (5-6) played their most complete game with an 8-3 win over the Winston-Salem Dash (5-6) on Sunday afternoon. Peña (W, 1-1) retired the first 13 batters he faced, and ultimately struck out nine over 5.1 innings to help his team split their four-game series in Winston-Salem before continuing their weeklong opening road trip. He led 4-0 before he threw a pitch thanks to some early production from his offense. The P-Nats' first two batters were retired by Winston-Salem starter Cristian Castillo (L, 0-1), but began a two-out rally with three straight singles from Telmito Agustin , Aldrem Corredor , and Jakson Reetz . Nick Banks , who had missed the previous two games due to a hit-by-pitch on Thursday, promptly put Potomac ahead with an opposite-field grand slam over the left field wall. It was the first homer of the season for Banks, and only the second home run for the P-Nats in 11 games this season. But David Masters made sure that the wait for the third home run wouldn't be as long, lifting a fly ball out to left in the third to extend the lead to 5-0. Peña would take the early lead and run with it, and didn't allow a baserunner until a one-out walk to Tate Blackman in the fifth. JJ Muno ended the no-hit bid with a clean single in the sixth, and Nick Madrigal's two-run triple later in the inning marked the end of the day for the young righty. Peña ultimately allowed three runs on three hits before being relieved by Frankie Bartow . Bartow retired all eight batters he faced, and Masters added a solo home run in the eighth for his team's first multi-homer game of the season. Leading 6-3 in the ninth, the P-Nats got a sacrifice fly from Agustin and an RBI double from Reetz to extend their cushion to 8-3. Jeremy McKinney got the final three outs to seal the Potomac win. The P-Nats continue their opening road trip on Monday as they head to Lynchburg for the only time in the regular season. RHP Luis Reyes gets the start for Potomac against Hillcats LHP Adam Scott. 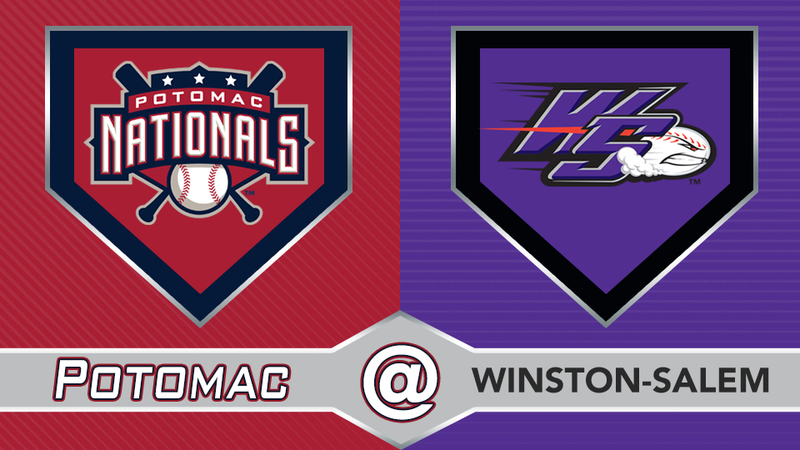 First pitch from City Stadium is set for 6:30pm, and the Potomac broadcast will get underway at 6:15pm with the P-Nats Leadoff Show. You can listen live at potomacnationals.com, at http://bit.ly/P-NatsBroadcast, or on the TuneIn Radio App.